Finally, a chicken noodle soup worthy of the Strawberry Patch! Not your Grandmother's chicken noodle soup. We've taken the classic to a whole new level. A savory broth with lots of noodles and carrots that look like you sliced them up yourself. 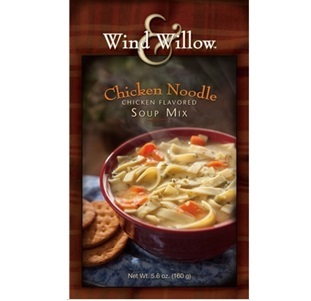 You may not be able to go back to your old chicken noodle soup after trying Wind and Willow Chicken Noodle Soup. Sorry Grandma! Combine contents with 6 cups of water. Bring to a boil. Reduce heat and simmer for 10 minutes, stirring occasionally. Copyright © 2016 The Strawberry Patch. All rights reserved.